Beginning in the early 90's on Rap-A-Lot records, Do or Die soon became one of Chicago's most notorious rap groups. Their single "Po Pimp" and "Do You" garned them considerable attention. However, due to their lack of industry understanding, the group was seemingly swallowed by the business. In 2005, signed to Legion Records and alongside the likes of Kanye West and Scott Storch - the trio consisting of AK, Nard and Belo once again are showing us how to po' pimp through their latest album, the self titled "D.O.D." MVRemix: Having been around during some of rap's most infamous times, what would you say was the one Hip Hop event that affected Do Or Die the most? Nard: When we came out in 1996 with "Po Pimp" and we had the hit joint - we really didn't understand the game then. So we really didn't take advantage of it. By not knowing how the game went; as far as when you've got a hit to keep driving and keep stayin' out to the public... we never did that. It was all just receive money and do what we was doing. That was the one thing that you had to take advantage of. Once you out there, you've got to milk the cow until it's dry. MVRemix: Sort of following on from that do you have any thoughts on the supposed 50 Cent/Game publicity stunt? Nard: We don't even trip over all that, man. We love music, so hopefully music don't die. We just want to keep the peace. MVRemix: What are your current feelings towards Rap-A-Lot? Belo: With Rap-A-Lot, it's cool. See the thing is, when you get into the music game if you don't have your business game on tight - nine times out of ten they gon' get at you. MVRemix: What do you think about the fact that BET wasn't supportive of De La Soul and The Beatnuts videos on their last releases and have paid little attention to older, accomplished groups when releasing newer material because they're not all glamour and glitz? Belo: To be honest with you man, De La Soul was so long ago - probably way before we came out... I don't think you can necessarily think that far. Nard: I think that they legends in the game. So De La Soul will take care of they business. 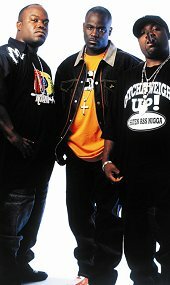 We don't really know the background of De La Soul, they lifestyles, but they legends in the game. Much respect goes to them, if there's a welcoming, we wanna be there. MVRemix: Definitely, but there was some controversy with regards to their video being played. They released a new album late in 2004 and BET gave the video little/no rotation... any thoughts on that? MVRemix: How did you hook up with DJ Quik? Belo: The thing that happened with DJ Quik is; some of our people got in contact with Quik's people - you know what I mean. We bumped together. When we went to L.A., Quik got in contact and told us he always wanted to work with us. But man, it was magical once we got up in the studio and we laid down a cut which is called "Church." MVRemix: For those that have just jumped on the bandwagon now, what would you recommend they check out aside from the new album to really get to know your music... which tracks/album? Nard: Well, we just had the "Do You" joint before this one featuring Tung Twista (Twista) from Chicago. There was also "Pimpin' Ain't Dead" which was off our fifth album - we got over 6,000 spins on that joint and that was a year after it was out. So that just goes to show you the power of Do or Die - it's just the lack of marketing and promotion. We didn't have the power to get a lot of people to know who we were. Now we're bringing that visual back to life, with that visual more people will get to know and understand who Do or Die is. MVRemix: Tell me about "D.O.D." Belo: Right now we've got a bangin' album that's goin' on - in the industry it's gettin' a big buzz right now. We've got producers on there like Kanye West, No I.D., Legendary Trackster, Scott Storch, Twista, Remy Martin, R. Kelly. The album is ridiculous! You know what I mean? MVRemix: How do you feel about the response thus far? AK: The response has been beautiful - people love the fact that we came back. Comin' to New York and gettin' love. Going to Miami and gettin' love! Goin' to Houston, Dallas... wherever we go we get love in those cities - it's just crazy right now. It's more respect than we even think it is. It's just love all the way around the board. MVRemix: Tell me about the D.O.D. DVD? Belo: We have a DVD out right now that we just launched. It's called "Do or Die: Die Hard." The DVD is talking about our past history and how Do or Die connected and got into the game. About the old label we was with which was Rap-A-Lot. About the new label we're with which is Legion Records. About the distributing deal that we got. We got uncut videos on there, street videos - a whole 'nother side that people always wondered about Do or Die but never knew of. The DVD is very deep man. People really need to pick it up as well as the new album which is out right now - self titled - "Do Or Die." We never put out bad music. Nard: Don't miss a treat, man! Nard: The clothing line is called "Po Pleasure" - we took the thing from "Po Pimp" which is one of our major, major big songs which everybody knew us by and we takin' the pleasure side lettin' people understand that. We really get pleasure out of wearing clothes because it's like a flossy thing. So one of them things is lets start our own clothing line and there's real, real major things goin' on in the near future. MVRemix: Have fun with this one - a la "Fight Club," "If you could fight any celebrity, who would you fight?" AK: We don't wanna fight, man! We wanna make good music. I mean we ain't duckin' none either, we ain't duckin' no fights. Belo: We tryin' to make money! MVRemix: Aside from the album, are you working on anything else? Have you been featured as guests on any other records? Belo: We got our label deal with D3 right now and we'll be featured on Kanye new album and a couple more new albums. Don't want to say any names. After that, we got a couple new films - we doin' our own film company. We have a couple of more things that have something to do with money but we don't wanna talk about that right now [chuckles]. You know what I'm sayin'? You get the main idea of what we doin'. MVRemix: Any last words for your fans? Nard: Yeah, you know... if people are really fans of Do or Die then they understand the struggle of Do or Die and where we come from - what we've been accomplishing and what we've been trying to accomplish. We definitely want the real support. You know, it's like that old saying - I'd rather have one true friend, then a hundred phony friends. To all our real fans out there - go out, buy the album. Call 106th and Park - get that video on the countdown. Belo: And also one thing to add to that is Do or Die - we try to do every show that we can. If you want us to do a show down there - you want to know us live and we never been down there. Vote us in, we comin' - if you can bring us, we ready.